Blade length :　39.8　cm or 15.6 inches. Sori :1.4cm or 0.5 inches. Width at the hamachi : 3.23cm or 1.27 inches. Kasane :0.67 cm or 0.26 inches. Shape : The blade is Naginata naoshi style wide and thick gorgeous wakizasi. Jigane :Itame hada and masame hada mixed with jinie attach visible to see the texture. Hamon :Niedeki notare gunome and ashi work. makers moved to Izumo, Bizen and other district. The blade is active wild feeling sword. samurai do not use Naginata anymore, so they changed them to Wakizashi. 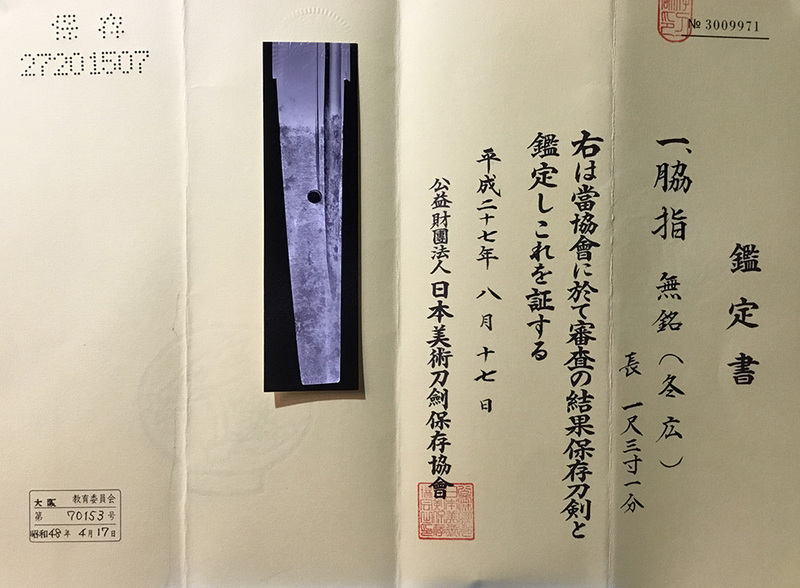 sword makers made this kind of shape wakizashi as original one. The blade is gorgeous and wild feeling wakizashi. Aoi Art Syoshin Kanteisyo. : whole Oshigata.